Back in 1991 I wrote a poem for my mom to wish her a Happy Birthday. 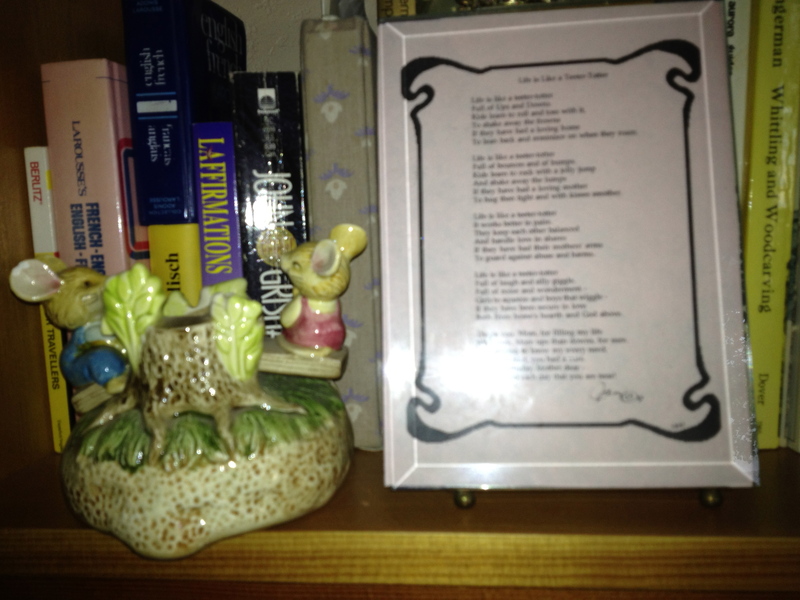 With the framed poem, I gave her a ceramic teeter-totter. The piece is a wind-up music box that plays “Playmates” as the little mice go up and down. She always had the poem and music box with her the next fourteen years as she was in and out of hospitals, rehab facilities, and nursing homes. When she died, I inherited them – and I treasure the memories they bring to mind. My mom had a cousin close to her age, Madge, who lived with mom’s family when she was a child. Eventually Madge married and moved into a home of her own. She and her husband had two sons, Ronnie & Donnie. Mom married and moved to California where my sister and I were born. I loved meeting and spending time with my cousins when we would go to spend Christmas vacation back in Washington with Mom’s family. Through the years I have stayed in touch with Ronnie. He is near my age. However, I had lost touch with Ronnie’s little brother, Donnie, until last Saturday. Donnie, whom I had not seen in 60 years, and his wife, Patti, came to spend this Labor Day weekend with Bob and me. What a treat! We reminisced and told stories and went through family photos and various family “artifacts.” One of my inherited treasures is a letter written on the occasion of our mutual great-grandparents’ 50th wedding anniversary. They were married September 1, 1875. The letter is “A Saga of the Valley” – the valley in and around North Bend and Fall City, Washington where my mother and Donnie’s mom were born and raised. The letter was typed on onion skin, is brittle and faded, and hard to read – but is is legible. I will retype it and send it to my newly reacquainted cousin, Donnie. He will share it with his daughter who is into the study of genealogies. As I was headed into the office to my computer, I spotted this ceramic teeter-totter music box. I realized I had forgotten to share that with Donnie. His mom, like mine, was a devoted mother who was wonderfully supportive of her two sons. I think he will appreciate this poem – and he certainly will concur – Life is Like a Teeter-Totter! Full of ups and downs. To lean back and reminisce on when they roam. Full of bounces and of bumps. To hug them tight and with kisses smother. To guard against abuse and harms. Full of laugh and silly giggle. Both from home’s hearth and God above. With love… more ups than downs, for sure. For every hurt you had a cure. I thank God each day that you are near! I have an old, tattered book end. It’s quite chipped. 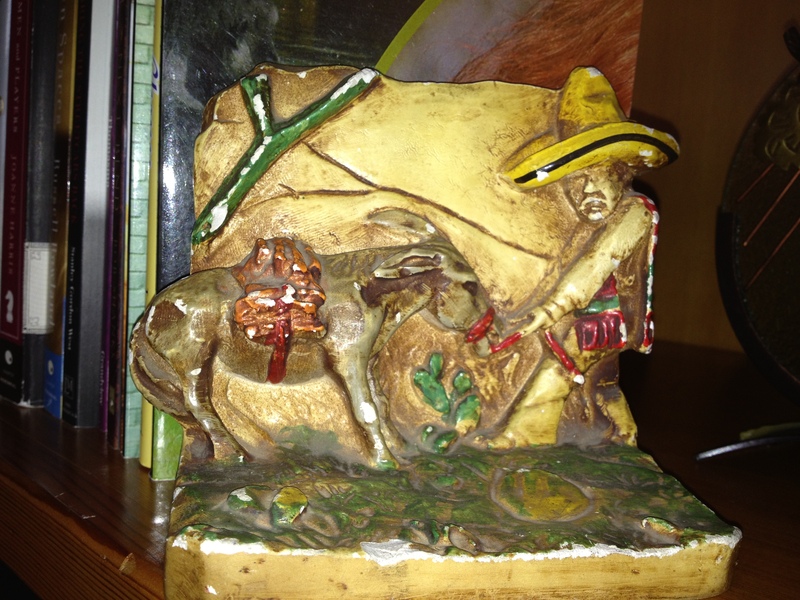 On it is an old man with a sombrero and a donkey, moulded out of plaster of paris. I think the set probably was purchased by my parents back in the late thirties shortly after they were married. Is that old Mexican fellow feeding his donkey or is he pulling the stubborn animal, trying to get him to go where he wants him? I prefer the latter story. This old piece of “junk” is probably not worth much on the open market. I doubt I’d get a quarter for it in a yard sale. But, to me – it’s priceless. My sister and I used to make up stories about this old fella when we were kids. It’s place of honor was on a table in the sitting room where the furniture of blond wood and red fabric was a wedding gift from Dad’s best friend. He and Dad had a bet about which of them would marry first. Dad won. The friend bought Dad a red sofa, chair, ottoman, and a table with matching blond wood. My niece has the furniture. My sister, Sally, has one of the book-ends. I have the other. “Will you tell me?” I asked. “For this story, I have all the time in the world,” I replied. We took a seat on her lovely white brocade sofa. “When I was a little girl,” she began… (somehow i knew the piece had to date back fifty years or more, so her introduction didn’t surprise me)… “my dear father used to take my mom every now and then to the local jewelry store and let her pick out a piece of jewelry. My sister and I were not trusted in the store where so many pretty, shiny things were sitting at finger-tip level, so we waited (in good weather) outside the store while they went in to do their shopping. In the window of Severson’s Jewelry Store sat this carving. My sister and I called the old couple Grandma and Grandpa. To pass the time while our parents were inside, we made up stories about them. Our imaginations were wild, and we kept one another well entertained. One day when we arrived at the store, the old carving was not in the window. Mr. Severson had brought it inside. It was in a glass case at the back of the store. He said it was time to revamp the store’s windows. With a promise that we would not touch anything, our parents let us come inside and sit in front of the glass case. By the twinkle in his eye and his occasional chuckle, we could tell the store owner was eavesdropping on our story-telling and enjoying the tales my sis and I created. “Eventually Mr. Severson retired, the store was closed, and the old couple on the carved bench disappeared. My sister disappeared at about the same time. She was twelve years old when she was tragically killed in a car accident. Mr. and Mrs. Severson came to her funeral to express their condolences. A few years later, we went to Mrs. Severson’s funeral to express our condolences to the jeweler who had become an old friend of the family by that time. How Would You Answer These Questions?